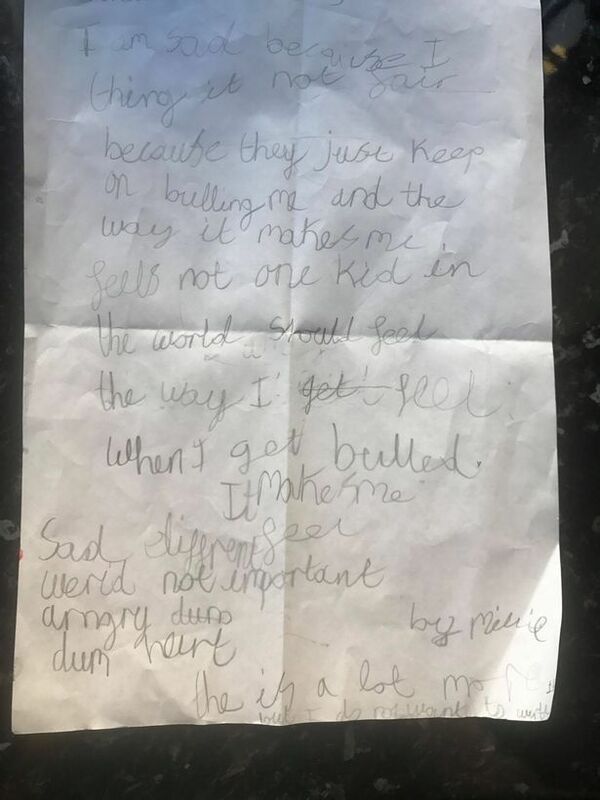 An eight-year-old girl has written a heartbreaking note telling her parents she wants to die after being tormented by bullies at school. Mum-of-two Naomi O’Neill, 28, was stunned when she found the note at the bottom of her eldest daughter Millie's bed. 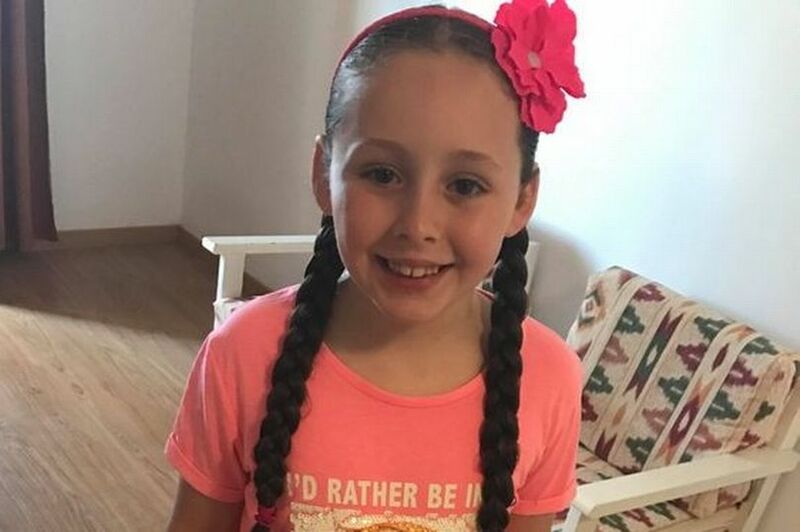 She told the Liverpool Echo that Millie has been bullied for weeks - with one pupil telling her he would "slaughter" her family - and is so afraid that she has tried self-harming in a bid to be kept at home. The schoolgirl wrote in her letter: "Not one kid in the world should feel the way I feel when I get bullied. "It makes me sad, I feel different, weird, not important, angry, dumb and hurt." The headteacher of Lister Junior School in Tuebrook, Liverpool, was “shocked and saddened” to hear of the note, and said Naomi had told them Millie was happy only last week. Millie's parents - who want her to switch schools - learned of the alleged bullying when Millie had trouble sleeping at night and they took her to counselling. She claimed one of the bullies told her he was going to “slaughter" her family and she was staying awake to "protect" them, the reports. Naomi said the child responsible was disciplined, but other children continue to bully Millie, who wrote "I want to die" in her letter. It reads: “I am sad because I think it is not fair, because they just keep on bullying me and the way it makes me feel. “Not one kid in the world should feel the way I feel when I get bullied. It makes me sad, I feel different, weird, not important, angry, dumb and hurt. 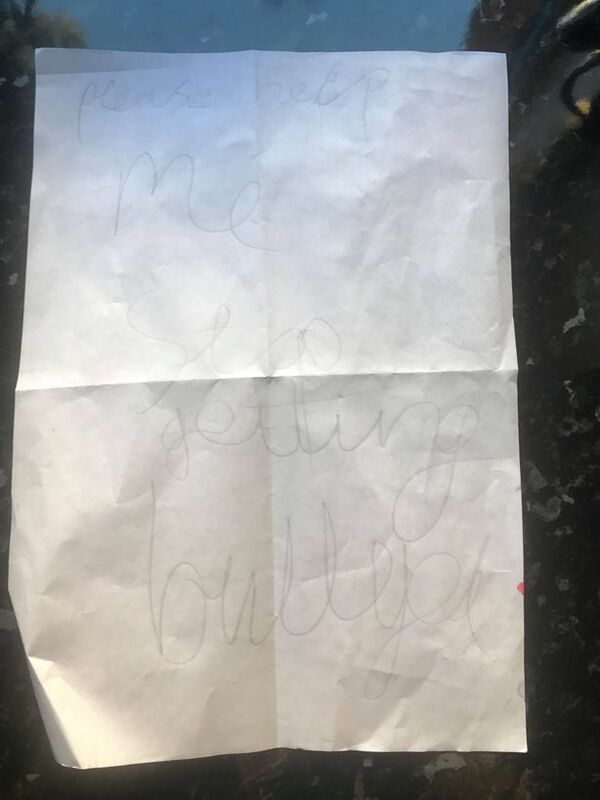 Naomi, from Tuebrook, Liverpool, found a note at the bottom of her daughter’s bed which carried the heartbreaking words “no kid in the world should feel the way I feel”. She then sat down with Millie before school and asked her what was going on - but what she heard broke her heart. Naomi said: “I went in to make her bed and I found the note at the bottom of the bed. I couldn’t believe it. “You could tell it’s been written in a rush as if she’s panicking, she usually has beautiful handwriting, it was as though she just couldn't face school. “I sat her down and asked her what was wrong and she told me about the bullying - she just said ‘I want to die'. Naomi has also noticed worrying changes in her daughter’s behaviour, saying she has gone off her food, doesn't want to wear certain clothes and wants to alter her appearance. She shared a picture of Millie’s note online in the hope of raising awareness of bullying. Now, as a way to make her daughter understand she’s not alone, she has told her for every share the post gets, it means she has another friend who is supporting her. After telling her the news, Naomi says it is the first time she’s seen Millie smile in a long time. She added: “I just wanted to put it out there to raise awareness because I think people think it’s only older kids that have issues like this, but it just proves younger kids can do it too. Head of Lister Junior School, Simon King, said: “We are shocked, saddened and obviously really concerned about the note. We met with mum earlier today to discuss the issue and she informed us that she wishes for Millie to go to another school, which is very sad as only last Thursday she told a member of our staff how happy Millie was at the present time.